The Facebook office at Menlo Park is home to a variety of employees. Software engineers, designers, UX developers and data scientists all work out of the large campus, and closely interact with one another. Someone at the office was clearly observing the differences between people with different roles, and came up with very clever ways to differentiate them. 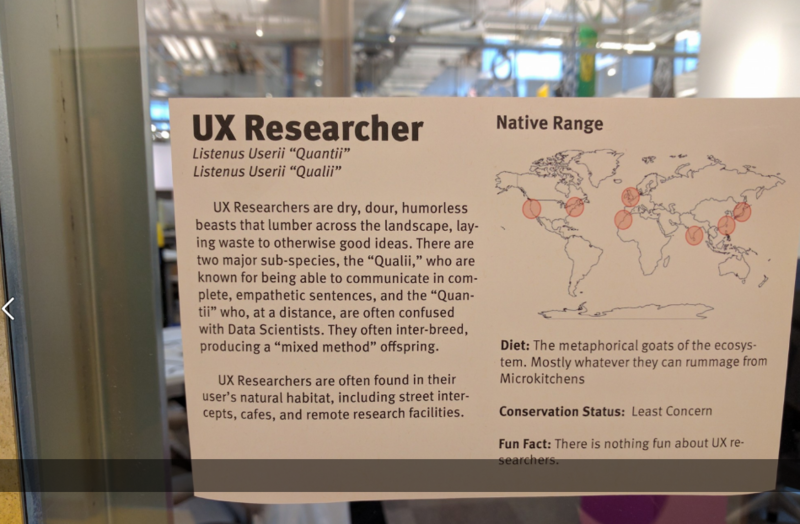 In a series of posters that were posted in the Facebook office, different employee roles were analyzed, taxonomic style. 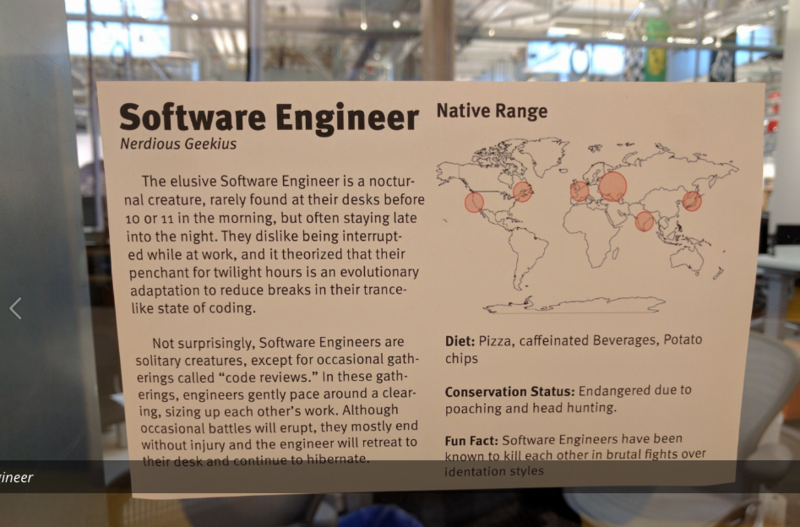 A software engineer (Nedious Geekius, according to the poster), for instance, is described as “a nocturnal creature, rarely found on the desks before 10 or 11 in the morning.” The description goes on on to talk about a software engineer’s diet (Pizza, caffeinated beverages, potato chips), and a fun fact: Software engineers have been known to kill each other in brutal fights over indentation styles. 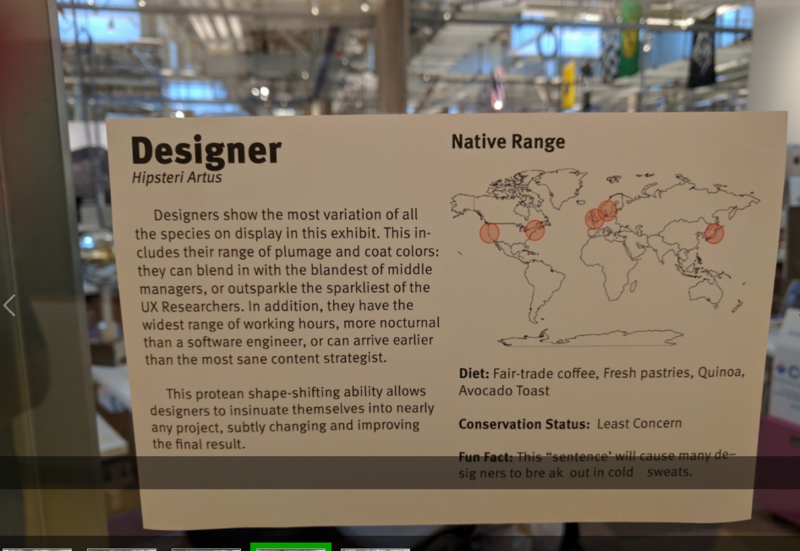 The poster also marks out the places where software engineers are found on a world map – the US, Europe, and India seem to be hotbeds. 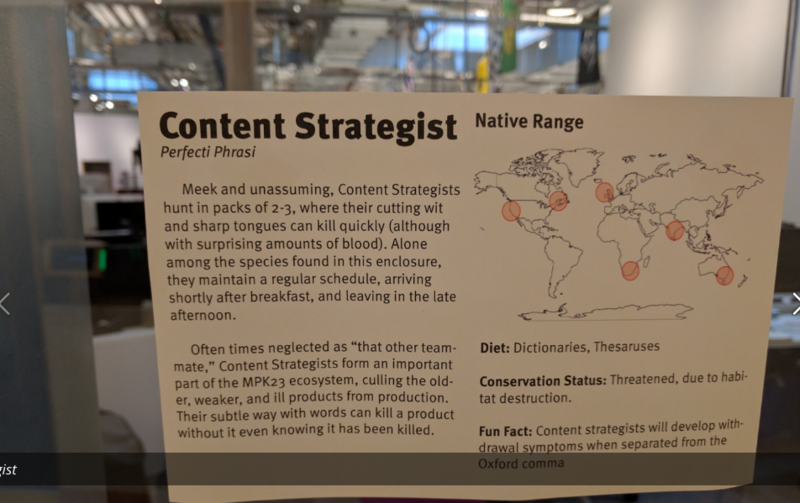 There was one for Content Strategists as well, who supposedly enjoy a diet of dictionaries and thesauruses, and develop withdrawal symptoms when separated from the Oxford comma. 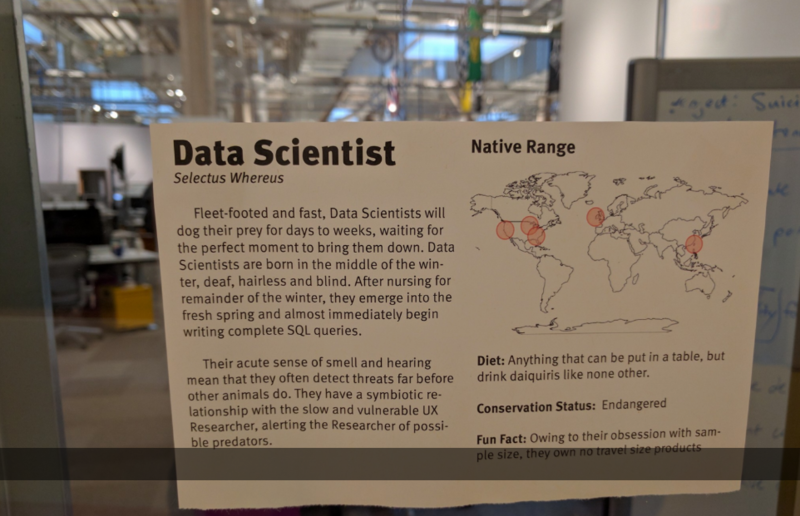 A Data Scientist is fleet-footed and fast. They are apparently born in the middle of winter, deaf, hairless and blind. After nursing for the remainder of the winter, they emerge into the fresh spring and immediately begin writing complete SQL queries. And finally Designers (“Hipsteri Artus”) seem to be able to insinuate themselves into nearly any project, and subtly change and improve the final result. The posters are hilarious, and poke fun at the stereotypes commonly associated with different professions. But Silicon Valley being Silicon Valley, some people are up in arms about the “lack of diversity” in the posters. Critics are outraged that none of the professions seem to have people in Africa, and have claimed that this points to the White and Asian bias in tech companies. We, on the other hand, are just having a laugh at the jokes. And plan to keep feeding our in-house Content Strategist a healthy diet of dictionaries and thesauruses.